^ 法國電視節目實驗 參賽者成殘暴虐待者. 2010年3月17日 [2013-08-29]. Blass, Thomas. "The Milgram paradigm after 35 years: Some things we now know about obedience to authority", Journal of Applied Social Psychology , 1999, 25, pp. 955-978. Blass, Thomas. (2002), "The Man Who Shocked the World", Psychology Today, 35:(2), Mar/Apr 2002. Blass, Thomas. (2004), The Man Who Shocked the World: The Life and Legacy of Stanley Milgram. Basic Books (ISBN 0-7382-0399-8). Levine, Robert V. "Milgram's Progress" . American Scientist. Book review of "The Man Who Shocked the World: The Life and Legacy of Stanley Milgram". Thomas Blass. xxiv + 360 pp. Basic Books, 2004. Milgram, Stanley. (1963). "Behavioral Study of Obedience". Journal of Abnormal and Social Psychology 67, 371-378. Milgram, Stanley. (1974), Obedience to Authority; An Experimental View Harpercollins (ISBN 0-06-131983-X). Abridged and adapted from Obedience to Authority. Miller, Arthur G., (1986). "The obedience experiments: A case study of controversy in social science". New York : Praeger. Parker, Ian, "Obedience". Granta  Issue 71, Autumn 2000. Includes an interview with one of Milgram's volunteers, and discusses modern interest in, and scepticism about, the experiment. 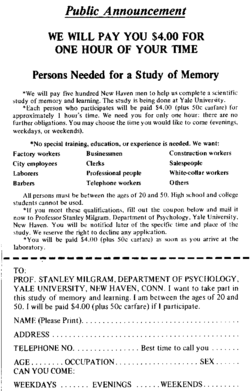 Wu, William, "Practical Psychology: Compliance: The Milgram Experiment." . 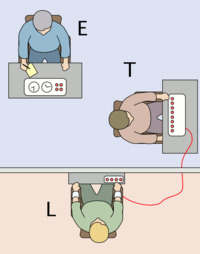 The Milgram Reenactment, 2002. Color, Exact re-enactment of one condition of the obedience experiment. Created by conceptual UK artist Rod Dickinson.